Hello Aspirants, as soon many exams are in schedules so we posted article on Padma Awards 2017 which will be important part for your written exams so you can go through the below listed awards and the people who got them to enhance your knowledge. Hope you find them helpful. For any questions feel free to ask below in comments. 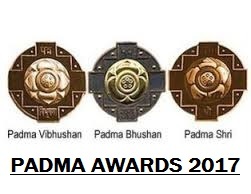 Padma Awards, one of the highest civilian Awards of the country, are conferred in three categories, namely, Padma Vibhushan, Padma Bhushan and Padma Shri. The awards are announced on the occasion of Republic Day every year. So this was all about Padma Awards 2017. Hope you would have found this article helpful for your exams for more such keep following us on Facebook or visit us on our website. For any questions feel free to ask below in comments regarding Padma Awards 2017.